Do you know how much most kids gets for losing a tooth these days? According to a survey by Delta Dental, the Tooth Fairy leaves an average $2.42, which is a 15.2% hike from what kids were pulling in in 2011. Jesus H. Christ! These kids are running a racket. When I was young and losing teeth, it was lucky for us to get a dollar and even that — despite this being the Clinton years — seems high considering that we were all going to keep losing teeth whether we got paid or not. What happened to the days when kids were happy with quarters and bottle caps and dried up old beans? When did our nation's youth get so good at monetizing themselves?! 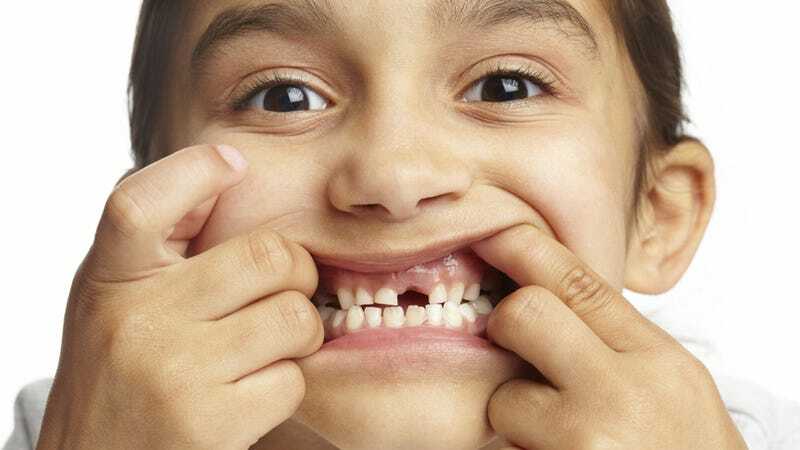 Delta Dental's survey, called the Original Tooth Fairy Poll, was conducted by asking 1,200 primary caregivers how much they left under their child's pillow after they lost a tooth. Having conducted the survey annually since 1998, they were then able to go back and see how the price per tooth corresponds with the the rise and fall of Standard & Poor's 500 index. According to Delta Dental, the 15% increase in the amount left by the tooth fairy indicates that our economy is getting stronger. Oh, great. Just another ploy by Barack Obama to turn America's future voters into a bunch of flaming leftists. Before you take an ice skate to your own teeth like Tom Hanks in Castaway with the hope of making some extra bucks, please remember that, while a child's tooth is worth about $2.42, your grownup teeth are disgusting and worthless.